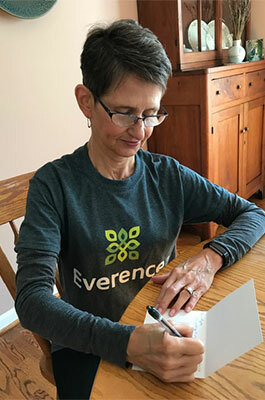 Twelve charities in the Harrisonburg, Virginia region felt the impact of 45 volunteers who gave their time for the fifth annual Everence® Week of Generosity. In addition to the volunteer hours, Everence donated a total of $2,500 to the organizations. From Oct. 21-27, Everence members volunteered at a variety of organizations, doing work such as helping at a thrift store, writing donor thank you notes, and encouraging reading among children. For every volunteer that participated in the Week of Generosity, Everence donated $50 to the organization where the volunteer worked. 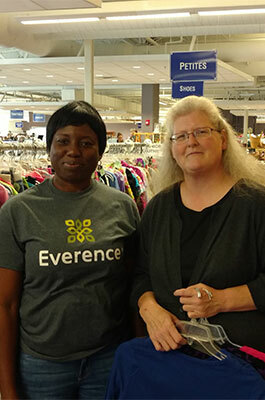 Helen Momoh (left) volunteered at the Gift and Thrift. “We appreciate the opportunity to join with our members in caring for our community,” said Teresa Boshart Yoder, Everence Managing Director. “Many of our members volunteer regularly, and the Week of Generosity gives Everence a chance to be a good neighbor and support the causes our members are passionate about. Giving back is important to Everence and our members. Learn more about our unique blend of values and finance, and how we give back to our community.